The detection of hidden explosives has become an issue of utmost importance in recent years. While terrorism is not new to the international community, recent terrorist attacks have raised the issue of detection of explosives and have generated a great demand for rapid, sensitive and reliable methods for detecting hidden explosives. 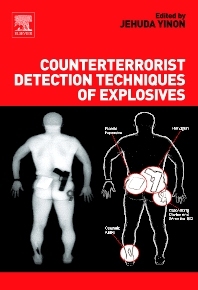 Counterterrorist Detection Techniques of Explosives covers recent advances in this area of research including vapor and trace detection techniques (chemiluminescence, mass spectrometry, ion mobility spectrometry, electrochemical methods and micromechanical sensors, such as microcantilevers) and bulk detection techniques (neutron techniques, nuclear quadrupole resonance, x-ray diffraction imaging, millimeter-wave imaging, terahertz imaging and laser techniques). This book will be of interest to any scientists involved in the design and application of security screening technologies including new sensors and detecting devices which will prevent the smuggling of bombs and explosives. For scientists and engineers in universities, research institutes and industry, involved in research and development of explosives detection techniques, as well as a textbook for graduate students in the natural sciences and in engineering. TABLE OF CONTENTS: Chapter 1. Detection of Explosives by Chemiluminescence (A.M. Jimenez, M.J. Navas). Chapter 2. Detection of Explosives by Mass Spectrometry (J. Yinon). Chapter 3. Explosives Detection Using Differential Mobility Spectrometry (G.A. Eiceman et al.). Chapter 4. Electrochemical Sensing of Explosives (J. Wang). Chapter 5. Explosive Vapor Detection Using Microcantilever Sensors (L. Senesac, T. Thundat). Chapter 6. Neutron Techniques for Detection of Explosives (R.C. Lanza). Chapter 7. Nuclear Quadrupole Resonance Detection of Explosives (J.B. Miller). Chapter 8. X-ray Diffraction Imaging for Explosives Detection (G. Harding). Chapter 9. Detection of Explosives by Millimeter-wave Imaging (D.M. Sheen et al.). Chapter 10. Detection of Explosives by Laser Techniques (C.A. Munson et al.). Chapter 11. Detection of Explosives by Terahertz Imaging (J.F. Federici et al.). Chapter 12. Explosives Detection Personnel Portals (K.L. Linker). Chapter 13. Biological Detection of Explosives (R.J. Harper, K.G. Furton).